Industria Scientifica Ottica S.R.L. (ISO) was an optical equipment manufacturer based in Milan, Italy. 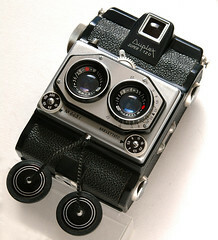 In the 1950s they made a number of similar 35mm rangefinder cameras, and some innovative stereo cameras using the dual 24x24mm format often used by 35mm stereo cameras, but placed across 120 film. Some of ISO's cameras were sold under the Hensoldt 'Henso' brand. ISO page at Fotocamere Italiane; text in Japanese, with pictures of the Lux, Bilux, Reporter, Standard and Duplex cameras. This page was last edited on 8 January 2019, at 11:33.